This set of alphabet dominoes matches uppercase to lowercase letters in alphabetical order. You will find a big green dot that says “BEGIN” where kids are to start this game, which happens to be with the uppercase A. 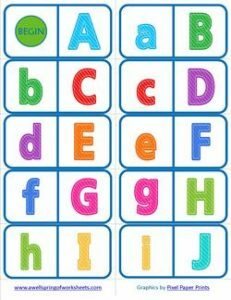 Kids match the lowercase letter to the uppercase letter and then go on to the next letter. The letters come in a striped and stitched print in various colors. Each upper and lowercase letter that go together are the same color. The last card, the lowercase z, has a big green circle that says “END” tells you the game is over. Kids can position these in the various positions that dominoes are known for or just in one long train from A to z. Print on cardstock for longer lasting cards and laminate if desired. Cut on the dashed lines to separate the dominoes and then trim around the corners to make them a true domino shape.